Asus has been manufacturing hybrid laptop devices for quite some time now. There is certainly a market for these devices and the company has introduced several variants of and iterations to the Transformer Book line of two-in-one Windows-powered hybrids. When Asus launched the Transformer Book T300 Chi during the 2015 International CES, the company declared, “Our Chi is thinner than Air.” This was obviously a direct hit at Apple, particularly its ultrathin MacBook Air. But the proclamation remains valid. With a 12.5” inch screen, the Transformer Book T300 Chi measures a scant of 0.3 inch for the tablet and 0.65 inch when docked whereas the MacBook Air measures 0.68 inch. The Transformer Book T300 Chi is nonetheless a beautiful device with interesting albeit limited computing capabilities. The cheap price tag makes the device readily attractive to individuals who are looking for entry-level laptops and hybrids. With a few budget stretch however, a prospective buyer is probably better off spending on an alternative device. Pros: Why you should buy the Transformer Book T300 Chi? 1. Affordable Intel Core M hybrid. Intel has specifically designed the new Core M processor for premium-priced tablets, laptops, and other hybrid devices. This processor also powers the expensive 12-inch MacBook from Apple and the Yoga 3 Pro from Lenovo. The performance of Intel Core M devices would of course vary depending on other hardware specifications and consideration. However, as a catchall, the processor is capable of running day-to-day productivity apps and casual games, as well as media consumption and Internet browsing. Asus has aggressively priced the Transformer Book T300 Chu to compete with other Intel Core M devices and hybrid laptops. With a retail price starting at $699, the device is a decent buy for entry-level casual and productivity users. 2. Complete with practical hardware specifications. Apart from the Intel Core M processor, the Transformer Book T300 Chi is also equipped with several hardware and configurations that make it a device capable for day-to-day productivity and entertainment. Depending on the price, the device comes with a 4GB or 8GB LPDDR3 SDRAM, and a 126GB or 256GB solid-state drive storage. The lower hardware specifications make the device ideal for casual use but for better productivity and usage, the 8GB memory and 256GB storage is the better and safest option. The device also comes with 2 megapixel 720p Web Camera, and a built-in speakers and an array microphone from SonicMaster. Connectivity and interface specifications include Intel Dual Band Wireless-N7265, Bluetooth 4.0 LE, an audio jack, micro USB 3.0 port, HDMI port, and an SD card reader. 3. Better-than-HD screen resolution for content consumption. High definition screen displays are now the standard screen specifications for both laptops and mobile devices such as tablets and smartphones. The Transformer Book T300 Chi however comes with a 12.5-inch WQHD or wide quad high definition touch-screen. The WQHD specification essentially means that the screen has four times the number of pixels found in a 720p HD display panel. This makes the device even better for day-to-day productivity and entertainment with the clear and sharp image reproduction. A better display with higher pixel density can help lessen eyestrain. This specification also makes multimedia consumption, especially watching HD videos online and offline, better than in devices with lesser pixel density. In addition to this impressive display, the device also uses the latest Intel 5300 HD. This GPU is newer and more capable than the GPUs found in 2013 laptops with Intel Core i5 such as the Microsoft Surface Pro. 4. Detachable hybrid device coupled and aluminium body for portability. Like any other hybrids, the Transformer Book T300 Chi is both a tablet PC and a laptop rolled into one. 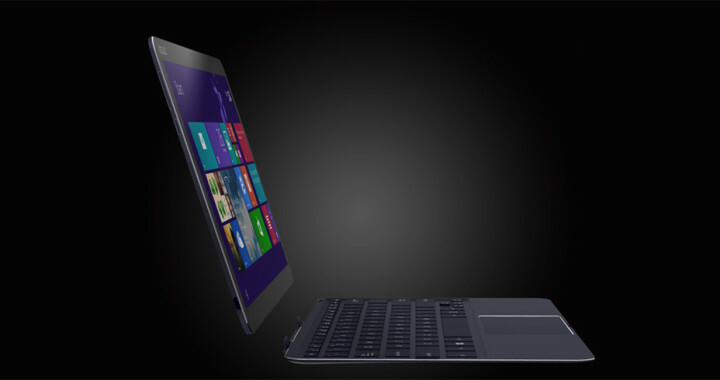 But what sets this device apart from other hybrids is the detachable keyboard. Dock the keyboard and it becomes a fully functional laptop. Remove the keyboard and the device transform seamlessly into a tablet PC. This feature gives users the best of both worlds—the mobility and simplicity of a tablet and the usability of a laptop. With an island-style keys and a decent-sized the touchpad, typing is comparable standard 13-inch laptops such as the MacBook Air or the XPS 13 from Dell. The thin and light design of the device is another selling point. Carrying the Transformer Book T300 Chi around is almost comparable to carrying an iPad Air or a 10-inch Android tablet. Consumers who are after the professional and premium look and feel could never go wrong with metal. The aluminium body of the Transformer Book T300 Chi gives this sense of elegance and sophistication—perfect for corporate professionals or just anyone who want a beautiful and functional device. 5. Better alternative to an Android or iOS tablet. Having a Windows-powered tablet would mean being able to run full productivity apps such as the Microsoft Office suite. Despite the fact that the respective app ecosystems of Android and iOS have evolved and expanded, many individuals still prefer typing their documents or making their presentations using a full Windows computer. Cons: Why you should not buy the Transformer Book T300 Chi? 1. Unimpressive battery life. The staying power of a laptop or any other consumer electronic device is a considerable deal breaker. Given the fact that Asus positioned the Transformer Book T300 Chi as a hybrid, consumers would look forward to doing a range of tasks revolving around entertainment and productivity. The battery life of the device is very unimpressive. Several benchmark and practical tests revealed that the juice last on an average of 5 hours—this is mediocre considering the mobility of and wide-ranging usability of hybrid devices. This battery performance is also a surprising letdown considering that Asus used the low-power Intel Core M processor. 2. Hassle from the micro USB port. One of the reasons Asus was able to make the Transformer Book T300 Chi thinner and lighter is the inclusion of a micro USB port. However, this could be a problem. A USB connectivity has several practical use these days—from file transfers through a thumb drive or USB cable to attaching other peripherals such as printers and external drives, among others. A full-sized USB port is still the standard and there is none of this in the entire device, not even on the detachable keyboard. Having a micro USB port and no full-sized port means that a user would need to carry around a set of cables and adapters to plugin something as simple as a thumb drive. This defeats the purpose of mobility. 3. Not capable of high-performance use. Although the Transformer Book T300 Chi is equipped with the impressive Intel Core M and an Intel 5300 HD, it is not actually built for high-performance use. As a portable and hybrid laptop, users should not expect the device to smoothly run apps that require higher system resources such as sophisticated photo and video editing software and high-definition graphic-intensive games. The device is specifically built for casual entertainment and day-to-day office productivity. Conclusion: Why you should or should not buy the Transformer Book T300 Chi? The Transformer Book T300 Chi is elegant and light. With an external built that echoes a sense of style and sophistication, the device looks perfect for professionals. Furthermore, packed with capable hardware specifications such as the latest Intel Core M and a WQHD touch-screen display, the device successfully demonstrates how hybrids should be—mobile and capable for casual and day-to-day productivity. This device essentially works as a slim Windows tablet or an ultrabook laptop. But the poor battery life is a deal breaker, especially for a device that should be carried around more often. Adding to this is the fact that the absence of a full-sized USB port somehow defeats the purpose of having a laptop-tablet hybrid. Users who are in the market for a hybrid PC and do not want to shell out a ton of money might nonetheless still love the Transformer Book T300 Chi. This device is perfect for those who love to consume contents for entertainment, such as watching videos online and offline, playing casual games, and reading ebooks, among others. It is also capable of running productivity apps such as word processor and web browsers. However, for users with a more flexible budget, they might want to check other lighter hybrids or laptops with better battery performance and hardware capability.